Does anyone know of any OS/2 1.x textmode and POSIX programs that can run under their respective Windows 2000 subsystems? For Windows 2000 there is Windows Services for UNIX. It includes a "full" set of UNIX-tools and gcc. Have a look at the library, it should be there. Also I posted on offers section a topic with 4 different versions including needed serials. Is that what you a talking about? I am not sure if I got you right. 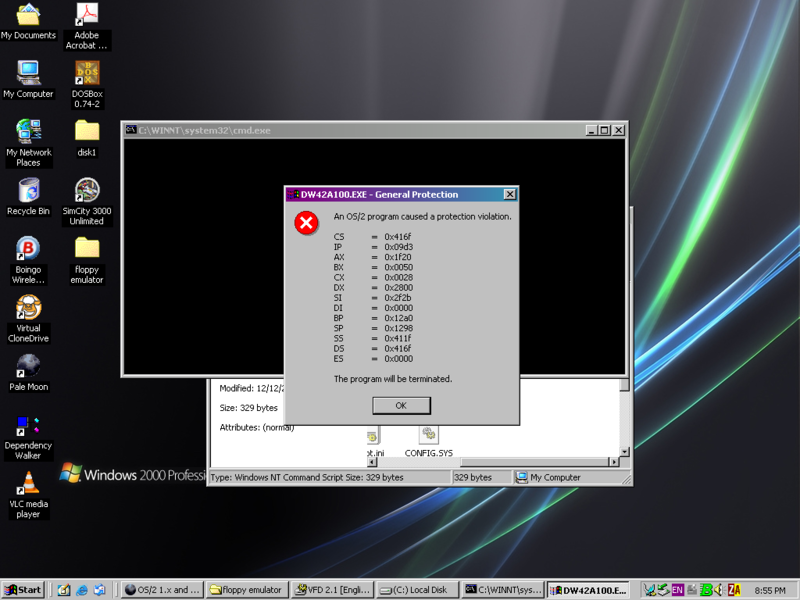 If you want POSIX programs compiled for OS2 running on Win2000 I cant help you. Thanks for the UNIX stuff. It does seem interesting. However I'll expand my inquiry to: do any OS/2 1.x textmode applications exist? I can't find any information about them. OS/2 1.0 had no GUI. As a result, there were many OS/2 1.x text-mode programs. They are kind of hard to find because everyone threw them away. I can see why they abandoned the subsystem in XP/Server 2003. There is a Windows NT 4.0 Presentation Manager add-on which I have. I'm not sure if it works on 2000 though. As I remember the OS/2 subsystem on NT / Windows 2000 self identified as MS OS/2 version 1.3 and will run command line programs from that version such as ANSI.EXE,ATTRIB.EXE,BACKUP.EXE,CMD.EXE,COMP.COM,DISKCOPY.COM,FIND.EXE,LINK.EXE,MORE.COM,RESTORE.EXE,REXX.DLL,REXXAPI.DLL,REXXINIT.DLL,SORT.EXE,STARTREX.CMD,STARTUP.CMDTREE.COM, and UNPACK.EXE. I use to experiment with this stuff which was interesting but not very useful. More useful was that it could run the programmer editor spfpc version 4.0 using a modified version of spf16.exe (the 16 bit os/2 exe from that product) and Microsoft Word 5.0 which was a dual DOS and OS/2 executable that would by default under NT / Windows 2000 run as an os/2 1.x application.